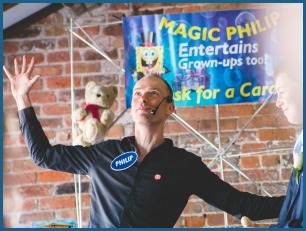 Hello, I am MAGIC PHILIP – one of the top children’s entertainers in Manchester, and live in Didsbury, Manchester. I am a full-time professional children’s magician and family entertainer. I want your child to have a very special party and one they will never forget, or your money back. Your party entertainment package will be tailored to the age of your audience, ensuring everyone is included and having the time of their lives. Please check my availability and get more information on my party entertainment packages as I would love to be part of your next special event. If you are considering other children’s entertainers in Manchester, please check if they can offer you a money back guarantee, and test out their customer service. I pride myself in awesome customer service and will communicate via email and phone to provide a stress-free run-up to your child’s amazing MAGIC PHILIP party. “A whopping great thank you for your fantastic non-stop show. The children were all mesmerised and the parents were delighted with how you had such a way with the children. The children were all entertained and that is quite a feat when some were so young. Well done.” – Yvonne Peet, Director, Ichthyosis Support Group, Manchester United. My passion for entertaining children kicked my magical career off in the mid 90s after leaving my pharmacist job at Alder Hey Children’s Hospital. Magic had overtaken my pharmaceutical interests. I spent time with top professional children’s entertainers and learned exactly what it takes to make children laugh while being amazed. Early-career highlights included entertaining at Brooklyn Beckham’s 3rd Birthday at The Printworks, Manchester and being invited to perform for HRH Prince Charles. I was flown out to the world’s only seven-star hotel – The Burj Al Arab in Dubai, for a New Year’s Eve performance. 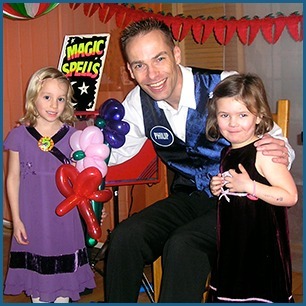 Now, nearly two decades later I have done thousands of magic shows for birthday parties, families, schools and nurseries as one of the top children’s entertainers in Manchester. I continue to invest in my performance and my professional development as a children’s entertainer. I also lecture and teach fellow children’s entertainers. I would love to be part of your next event to make it super special. Get in touch now and call me on 07970 871544 or click the button below.